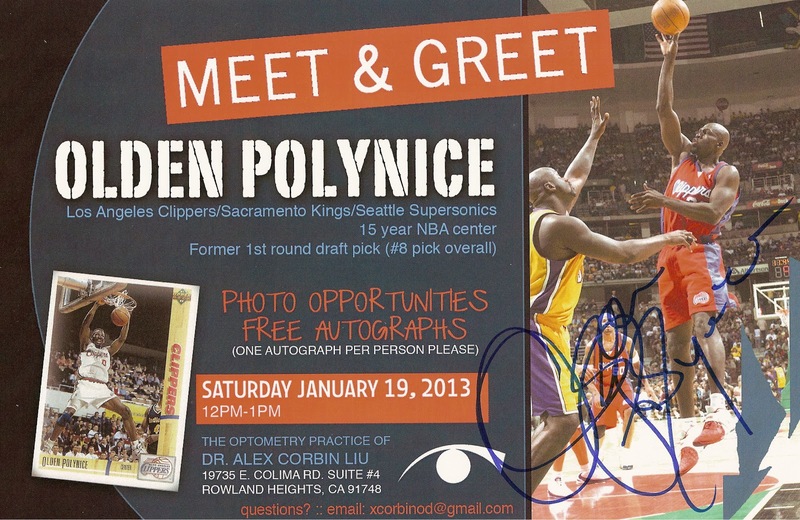 On Saturday my friend Alex hosted a free autograph signing featuring former NBA player Olden Polynice. 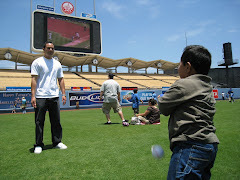 The event took place at his Optometry practice in Rowland Heights. It was a short one hour signing with Olden meeting and greeting all fans who came out. Before Olden arrived there was already a decent turnout of fans waiting in line. Olden arrived on time with his two daughters and signed away. 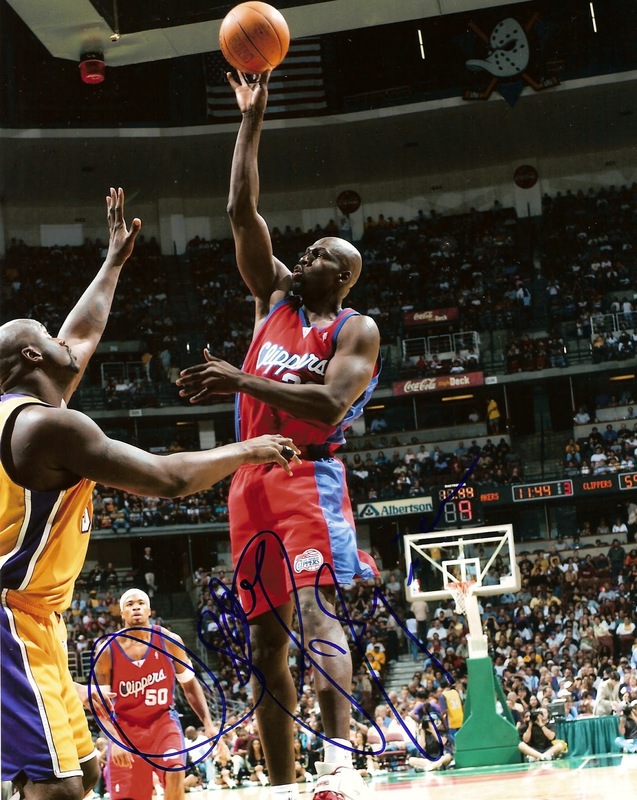 He signed every item that fans brought including basketball cards that the office gave away as extra items. It was a very fun and entertaining event with Olden taking the time to talk with all the fans. For those of you that didn't know, Olden is Haitian. Olden brought a plastic box so fans could give a donation for Haiti relief as they stepped up to get their items signed. As the signing went on I noticed that the box slowly but surely got full of money. Not sure how much was raised but donating some cash for Haiti is the least we could do for him making the appearance. People in line? Around 60 people showed up. Items per person? All the items you brought. Giveaways? 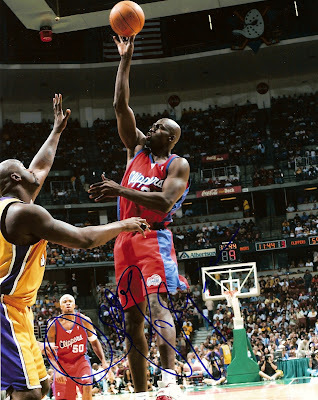 Olden Polynice basketball cards. her jacket. Olden was a little hesitant but signed it anyway. As you can see he couldn't help but laugh about it. Here is another picture of me and Olden. Olden posing with some kids. basketball cards that he had never seen before. a signing. Olden signed all of my 20 items. Haiti earthquake in 2010. The clip is titled "Haiti Survivor Stories". It turns out I missed the annual L.A. Fit expo to be at this event. I don't have any regrets at all since the majority of the celebrity appearances were the same people as in previous Expo events. It doesn't mean I can't reminisce though. This photo was taken at last year's Expo and for whatever reason was never posted. Another event is in the works at this same location. When the date and time is confirmed with the former athlete I will be sure to post the information. The details will also be posted on Alex's website and Facebook page linked below. 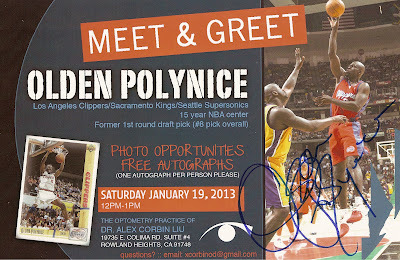 I'd like to thank Olden Polynice for his time and my buddy Alex for hosting this free event.